This week, we were sent the latest mental health journals from Butterfly Print. Let us explain what is involved and the thoughts behind each journal. Butterfly Print aim to make it easier for education professionals to access mental health resources. While it is widely agreed that positive mental well-being should be promoted, especially for children, often teachers and childcare professionals find there is a lack of tools available. We were sent the Mental Health Resources package, which included samples of the four journals within the collection. Each journal is suited to an age group, with the aim of supporting the mental and emotional well-being of the children, giving them a way to express their feelings. Counselling Directory team member, Debbie, shares her thoughts. “Sadly, the rise of mental health problems in children and young people is increasing, so we must do all we can to help reduce the often shocking statistics. 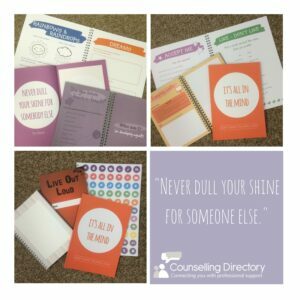 Butterfly Print have produced these really useful, fun journals to support the emotional and well-being of children and young people. Sometimes, children don’t know how they’re feeling… they may feel overwhelmed with anxiety and worry, or confused or uncomfortable about a situation that they don’t know how to deal with. Unfortunately, often the only way they know how to deal with them is to misbehave and the problem is never dealt with. The journals are aimed at all children and young people in education from Key Stage 1 to Key Stage 4. They are very well designed to extract their inner thoughts and feelings through interesting questions and quotes. Once completed, parents, carers and teachers can assess how the child is feeling and if they have concerns as to whether or not other support is necessary. This journal is aimed at the early years. Children as young as three can use this as a personal, private place to write down what they are feeling. In the journal, children are able to make statements about themselves, make decisions and learn self-acceptance. The Understanding Me journal is aimed at children aged seven to 14 (Key Stage 2-3) and focuses on the major changes going on in their lives. It acts as a mentor and coach, providing various phrases, actions and solution to common experiences. There is advice and support about bullying, being bullied, supporting friends and personal loss. Pages include sections on peer pressure, money and self-image, while also promoting creativity and playtime. Aimed at 14 to 15 year olds, this journal addresses those who are feeling overwhelmed, stressed and experiencing the roller-coaster of emotion that comes with being a teenager. At each of the sections, the reader is greeted with a positive quote related to the topic. “What of your impossibles will you make possible? This journal is made small and discreet, so that it can be kept in a blazer pocket is needed. This journal acts more as a personal notebook. The content appears in the form of doodles, scribbles and invites the writer to follow the style when writing their own thoughts. The journal takes the young person on a journey, exploring hopes, fears, body-image and gender issues. At the end of the journal, there is ‘language of emotional intelligence’. Here they are invited to write a manual as to how to understand them. Butterfly Print describe this journal to be “the end of the journey and a new place to start”. Workplace bullying - beat it! Why am I anxious all of the time?